It’s not every day that I make fig jam. But it’s also not every day that someone gifts me a kilo of figs and I drop them in the street. I’d gotten to the market late. Really, really late. Like, 5:45 P.M. on a Friday afternoon late. An hour before Shabbat began. So late that I wasn’t sure anything would be open. And indeed, many of the stands had already closed for the weekend, but the ones that were still open were offloading produce at cost or even less. At some stands, I was the last buyer before all remaining vegetables was unceremoniously dumped into the street. After I accused one shop owner of dumping perfectly good food, he explained that by Sunday morning it wouldn’t be useable so he had no choice. The stuff that’s left by late Friday afternoon isn’t beautiful, but it’s entirely useable and to be honest it doesn’t look any worse than the once-perfect vegetables left languishing in my fridge for a week. But back to the figs. They had already been marked down to a cheap 5 shekels per one-kilo basket. I was looking to stock up for Rosh Hashanah — figs are in season, and they’re also one of the symbolic seven species. 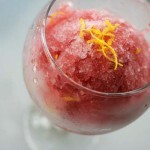 They’re great incorporated into all sorts of holiday dishes. “Take it. A gift,” the seller said to the last few buyers lifting the baskets of figs to see whether the fruit at the bottom was still good. “I intended to pay,” I told him. “I said it’s a gift,” he said, picking out a basket and handing it to me. Now, you don’t look a gift horse in the mouth — and in this case, you don’t look for bad fruit at the bottom of a gift basket of figs — but these figs happened to be beautiful, ripe, and bursting with juice. It was a good shopping day in general — by the time I finished, I was hauling off 8 eggplants and hefty amounts of carrots, zucchini and onions. “Do you have someone to carry that for you?” an old man asked. I must have looked a bit weighed down. Which is why, perhaps, I dropped a few bags of produce. And it wasn’t the sturdy onions. No, it had to be those beautiful figs. Splat against the ground. They all burst open in the bag, just like that. 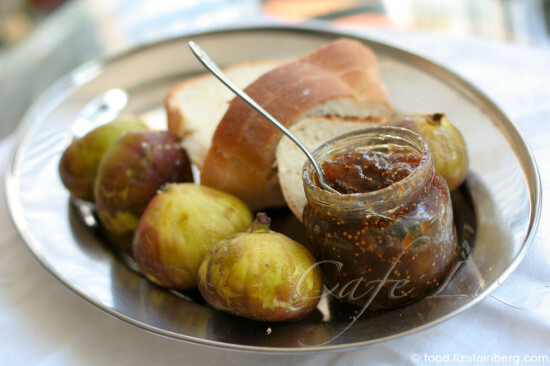 Now, if you find yourself with a kilo of figs that has to be used instantly if not sooner, jam is not a bad way to go. And a kilo of figs doesn’t actually make all that much jam — it condenses significantly. This jam incorporates lots of ripe figs and pairs them with a hint of pomegranate wine — pomegranates are another one of those symbolic foods. Not everyone has a bottle of pomegranate wine sitting around, so you could try substituting pomegranate molasses, port wine or just plain red wine. It turns out this fig jam is especially good served with eggplant pate (a.k.a. “mock” liver) and challah. At the moment, I’m enjoying making my classic challah recipe with a tablespoon of anise seeds mixed into the dough, inspired by a few of the recipes in Joan Nathan’s holiday cookbook. Note: This should be considered a refrigerator jam, meaning it needs to be kept in the fridge. 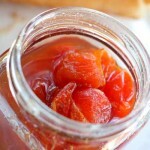 Jams that are meant to be canned and kept outside the fridge need to contain a specific amount of sugar and acidity in order to be safe for consumption, something I cannot vouch for in this recipe. Chop the figs and add to a pot with the sugar, lemon juice and pomegranate wine (or alternative). Bring to a low simmer, stirring occasionally so that nothing burns to the pot. Let cook until jammed. To test, put a small plate in the freezer until cold, drizzle a small amount of jam onto the plate and return to the freezer. When the jam congeals on the plate, you’ll know it’s done. Transfer to jars and store in the refrigerator. 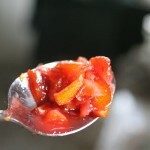 5 Responses to "Fig pomegranate-wine jam"
Great story, beautiful recipe. I much prefer the taste of jams like yours without much sugar. Shanah Tovah! That looks yummy-I will try it.Shana Tova! This looks amazing! I am obsessed with this recipe for fig and pecan biscotti that I found on kimkushner.com/blog and I feel like this jam will be divine on top! I cant wait to try the two paired together!